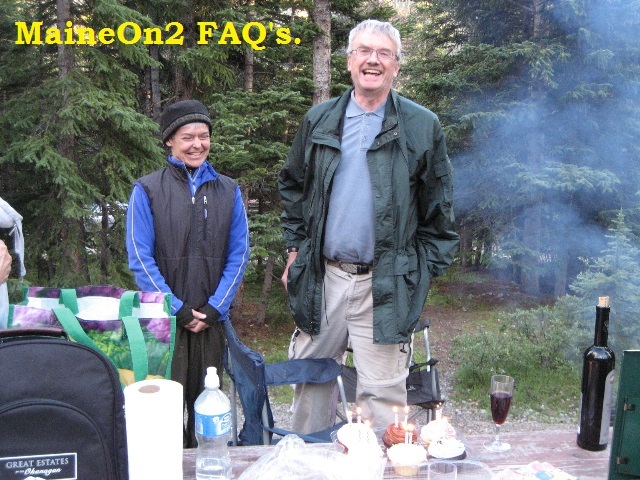 The MaineOn2 FAQ’s is essentially a repository for peer reviewed knowledge provided by fellow enthusiasts to be shared within the group and the FAQ for the benefit of all, on a self-service basis – the FAQ is not a research bureau. It is very much a co-operative effort, and if you can help then please do, see the section “You can Help!” towards the end of this page. When we (the editors) launched this site in the Spring of 2013, we hoped that these FAQ’s would eventually develop into a valued online resource for modellers of the Maine Two Footers across different times and places. Six years later, and we will let you be the judge of those hopes and this site. The core content was developed from an updated version of the original MaineOn2 FAQ’s first published in the Summer of 2003 by the late Bill Kerr (pictured below), and we have now added to and expanded the scope to related areas and topics. Picture: Bill Kerr and a fellow hiker enjoying a joke before sitting down for his birthday lunch out in the boonies. To read more about Bill Kerr, click here for My Friend, Bill Kerr; click here for A visit from Bill Kerr; click here to see Bill’s layout and here to see his scenery extra. This FAQ will attempt to answer most questions new members may have about modelling in On2. Standard disclaimer about information. It is more than an FAQ. Some information will address some common misconceptions, or update previous published information that has been determined to be in error. Information will be incorporated as it is provided. In many respects this will be used to alleviate the problems of attempting to search past postings at the Yahoo site for previous request for information. My thanks to the Maine Two Footers, MaineOn2, HOn30, and 7-8 Inch Scale Trains Yahoo! groups where I have obtained much of the information from posts to those sites. Thank you to Walter Orloff, Terry Smith, Robert Werner, John Hitzeman, Trevor Marshall, Keith L. Lewis-Jones for their contributions. The stand alone website was inadvertently lost whilst Bill was changing ISP in 2010. At the time, Bill was focussing on his Selkirk Scenery business, but still found time to search his old PC’s and build up a rough working version of most of the FAQ’s in HTML web format from assorted backups dating from 2005 to 2007. “…..be aware that new photographs and other information are still turning up, and that this may cast new light or interpretations on what in all intellectual honesty (or by professional research standards) have been guesses by knowledgeable amateurs (at best) in the past. Try to understand what various people write or say and make your own decisions about their evidence for supporting their positions and comments. Recognise that a photograph may be wrongly captioned or mis-interpreted, even if it has been published a number of times”. In 2005, Bill also established a separate MaineOn2 pictures FAQ using Fotopic as the hosting service. In March 2011, without notice, Fotopic went offline and it was believed that all the picture collections had been completely lost. However, in the Fall of 2012, Fotopic allowed temporary access to a back-up copy from several months earlier than the shutdown. This access enabled most of the MaineOn2 FAQ pictures to be downloaded and re-published here under the original album titles with updated content. By this time, (the Fall of 2012), Bill was fighting a return of the cancer which would ultimately result in his demise in July 2013, and he asked the friends to ensure that the material collected was still made available to interested parties, and he expressed particular concern that the original authors should be credited for their contributions. After some discussions and trials, we took a group decision to use this blog format for re-publication, as it was more accessible for us as a group, avoiding the need to use HTML coding (which none of us then knew) and could be used to re-publish both the pictures and much of the original content of the written FAQ’s. Bill saw the first topics and pages posted, gave his approval and encouraged us to continue with this format. Our initial work in the Spring of 2013 focused on re-publishing the pictures FAQ’s as this was the simplest way to get started and establish a framework for the blog version. Later in the first year, our focus changed to checking, updating and re-publishing the written content of the FAQ’s, in sections, configured for this blog format. In our second year we were fortunate that both Maynard Stowe and Mark Hall wrote about their work producing the Putnam & Stowe and The Forney Co/Portland Products 0-4-4T Forney locomotives respectively; and to receive permission from Chuck Collins to reproduce his prototype locomotive information previously published on his now defunct website. Our third year continued the focus on consolidation and more prototype information; we transferred Trevor Marshall’s track schematic’s to this blog and were fortunate that Dwight Smith allowed us to publish the pictures of his visit to Bridgton in the 1940’s. Terry Smith finally managed to update the posting about Tin Roofs and Colour Schemes. Our fourth year of publication saw a mix of new topics filling in the history of the smaller suppliers active in the early to mid 1970’s combined with re-publishing some older topics from the earlier versions to show exceptional layouts and modelling from Ric Collins, Peter Barney and Bob Harper. Our fifth year has seen us passing 100,000 viewings which we feel is a significant milestone for such a minority interest. Some new topics were posted and some older topics were updated. Our sixth year was fairly quiet but Terry Smith found time to re-check and update his personal tests on Maine On2 Locomotive draw-pulls, rolling stock and truck friction and grades, and present the update information on this blog. A number of older topics were updated with additional pictures and links. We welcome any on-topic comments about the content and presentation of the current FAQ’s and in particular corrections for any pictures and/or posts which have been incorrectly attributed. We also welcome any offers of additional information or pictures. Please use the “message” or “reply to” facility to contact us. Please advise us if you find links not working as expected, or if external referenced websites are no longer valid. We welcome any suggestions for improved links both within these FAQ’s and to external sites.